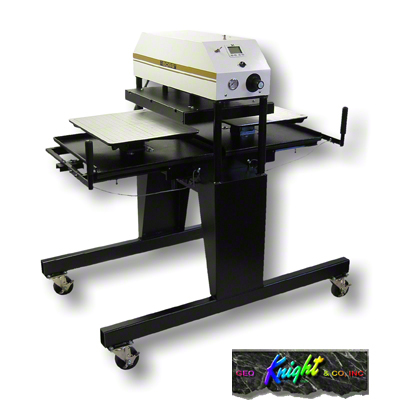 George Knight® Air Operated Twin Station Shuttle Press on Stand with casters. 16"x 20". High production, twin station heat transfer press. George Knight heat presses use UL recognized components. Designed for optimal pressing efficiency in a demanding heat transfer production environment, and compact. 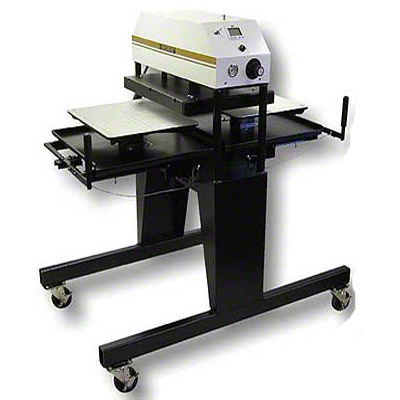 George Knight® 394 Shuttle Press 20" x 25" - High production, twin station heat transfer press. George Knight heat presses use UL recognized components. Designed for efficiency in a production environment utilizing two shuttling tables, for constant pressing load and unload while the opposite table is pressing.